As I complete this post from my home in Manchester, England, it is 4:30 pm and already fairly dark outside. Many people think that it will continue to get dark earlier each day in the afternoon until we reach 21 December, the winter solstice. This, however, is not the case. The evenings in fact start to draw out a week or so before December 21, so it is already getting lighter in the evenings, although it does not start to get lighter in the mornings until early in the new year. This post aims to explain this interesting phenomenon. 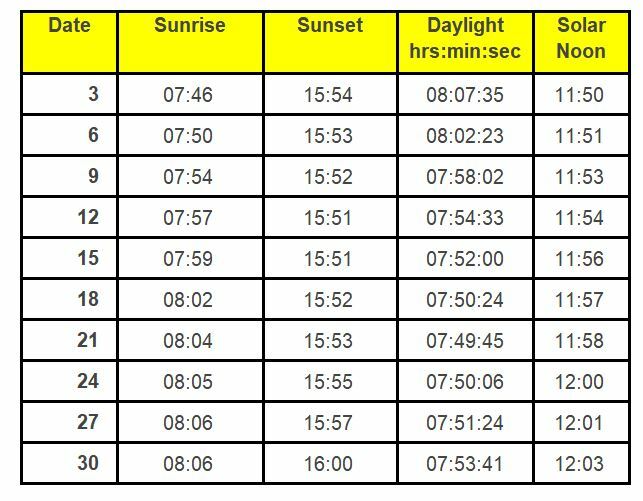 The table below shows the sunrise and sunset times for London for December at three day intervals. In the table above, the daylight column shows the number of hours, minutes and seconds between sunrise and sunset. This clearly shows that 21 December has the shortest period of daylight, but while the time of sunrise continues to get later and later throughout the whole of December, the time of sunset stops getting earlier around 12 December. The final column shows the solar noon, the time of day that the Sun is at its highest in the sky or, to put it another way, the mid-point between sunrise and sunset. 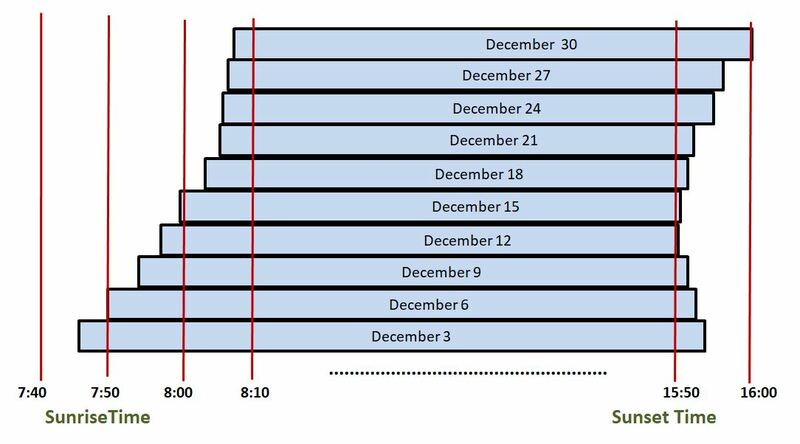 The table shows that during December the solar noon drifts later by about 30 seconds each day. A solar day is the period of time between solar noon on one day and solar noon on the next day. The length of a solar day varies throughout the year. It is at its shortest, around 23 hours 59 minutes 38 seconds, in mid September and at its longest, around 24 hours 30 seconds around Christmas Day. 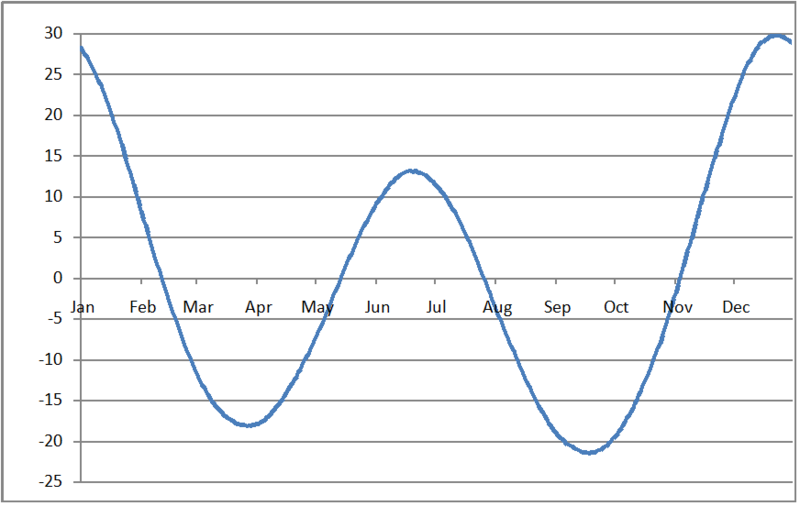 The graph shows the difference between the length of a solar day and its average value of 24 hours throughout the year. For example, a value of 10 means a solar day is 24 hours 10 seconds long , 20 means a solar day is 24 hours 20 seconds long, and -10 means a solar day is only 23 hours 59 minutes 50 seconds long. As you can imagine, it would be complete chaos if our clocks and watches had to cope with days of different lengths, so we use 24 hours, the average over the whole year, for all timekeeping purposes. So, in December solar days are on average 24 hours and 30 seconds in length, while our clocks and watches are still assuming that each day is exactly 24 hours. This causes the day to shift about 30 seconds later each day, as shown in the diagram below. This explains why the evenings start drawing out before the shortest day, but it continues to get darker in the mornings until the new year. Sunrise and sunset for London in December. The fact that the Earth moves in an elliptical orbit around the Sun and its speed varies, being faster in earlier January, when it is closer to the Sun and slower in early July, when it is further away. 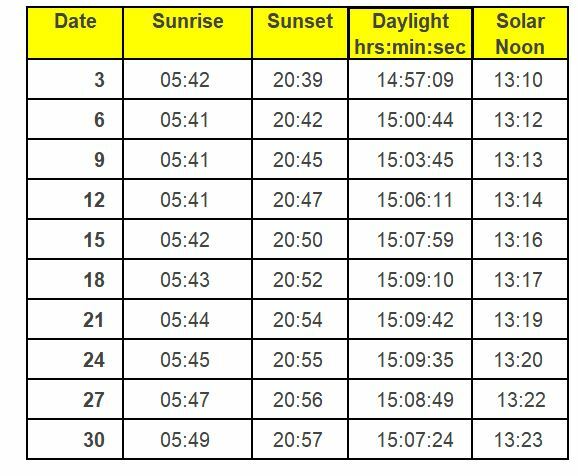 If you want to know more about how these factors work together to vary the length of the solar day, see my post September 18 the Shortest Day. In the southern hemisphere 21 December is the summer solstice, the day with the most daylight. What happens is that the Sun starts rising later before December 21, but it doesn’t start getting dark earlier in the evening until well after December 21. This is illustrated in the table below, which shows the sunrise and sunset times for December for Wellington in New Zealand, which lies at a latitude of roughly 41 degrees South. It is not strictly true to say that a solar day is on average exactly 24 hours long. As readers of a previous post, “The Days are Getting Longer’, will be aware the Moon is gradually getting further away from the Earth. 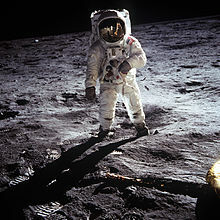 In fact, equipment left on the Moon by the Apollo astronauts has confirmed that the average distance from the Earth to the Moon is increasing by about 4 cm a year. As the Moon gradually saps energy from the Earth, the Earth’s rotation slows down, causing the length of a day to get gradually longer. In the year 1900 a mean solar day was 24 hours long. Now, in the early 21st century, a mean solar day is actually 24 hours 0.002 seconds long. To prevent the time we measure using accurate clocks from drifting away from the solar time we need to add an second called a leap second roughly every 18 months. Without exaggeration, I’ll assert that you were born, in part, to explain stuff like this-here with an enviably satisfying style! So thanks.. to all responsible. Hits a particular chord for me, who watches the sunset and sunrise almost every day, cross-checking the published data, trying to internalize what’s driving the variances as if it’s somehow my duty, calling, or perhaps just an odd hobby. Btw, I’d noted this ‘bump’ in the hand-drawen charts I use here in Israel at 32 N latitude. Never over-much loved the ‘Equation of Time’; feels like another ‘epicycle’to my purist taste. Good explanation. I’m happy to see the later sunsets now. As I understand it the average distance between the moon and the earth increases very slowly, causing the length of our natural day to increase very slowly also. Is my understanding correct? In the US we count the solstice as the beginning of the winter season. I understand other cultures count the solstice as the middle of the season.